Ag News Daily was created in 2016 by Mike Pearson and Delaney Howell. After discussing what the agricultural industry needed, the idea of podcasts started to form. Ag News Daily was created with two intentions in mind: 1- to provide people in the industry with accurate, up to date information in a newer format; 2- to connect listeners with other people in the agricultural industry. Join the two as they bring you the latest "what's happening" in the industry, the day's closing market prices, and an interview with someone in the industry. Delaney grew up on a family farm in Southeast Iowa and has been involved in agriculture from a very young age. Her father and oldest brother run a finish feedlot cattle operation, run row crops on their sandy soil in SE Iowa, and, her mom has a hobby chicken farm. Delaney holds a Bachelor's of Science degree in Agricultural Sciences and minors in Broadcasting and International Studies from Northwest Missouri State University and a Master's in Agricultural Communications through Texas Tech University. During college, her passion for agriculture exploded as she traveled the world, now totaling 20 countries; interned for Iowa Public Television's, Market to Market; and, found her voice in the industry. Her most exciting career move was stepping in as the youngest, and first female host of the nationally syndicated Agribusiness show Market to Market. As her passion has continued to grow for the industry she has started her own small business, AgCulture Media LLC, which specializes in video production for technologically savvy agricultural companies. She also freelances for This Week in Agribusiness, Agri-Pulse, and hosts a radio program on Your Ag Network. Delaney is a member of the Iowa Cattleman's Association, one of 28 members part of the 2017 Young Cattlemen's Leadership Program (YCLP) and an Iowa Cattlemen's Association member, and a broadcast member with the National Association of Farm Broadcasting (NAFB) organization. Mike grew up in southern Iowa surrounded by agriculture; first, helping herd the family hogs back in when they'd escape the pasture farrow operation, then later helping herd the family cattle back in when they'd knock over the "fence". Livestock got in to his blood, but he wasn't sure how to make a career out of agriculture, so he graduated from Simpson College with a Bachelor's of Arts degree in History and Philosophy, and found a position at a community bank in Grinnell, Iowa, two hours from the family farm. He married his wife, Heidi, and they settled in Grinnell. 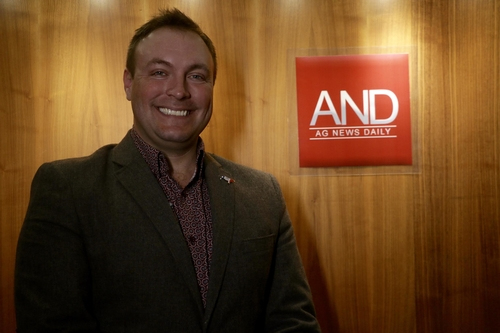 Following years of working in the banking industry, he received a call from Market to Market, in 2012, after the passing of his father, to host the well renowned agriculture news show. Mike and Heidi also bought a cattle feed yard outside of town that year and started to build their cow/calf herd. In the years since, Mike has traveled around the world to share his passion for agriculture as a commodity market speaker and story teller. Currently, Mike serves as a district director and member of the Board of Directors for the Iowa Cattlemen's Association, a member of the Iowa Farm Bureau, and is also a member of the National Association of Farm Broadcasting (NAFB) organization. In 2015 he was named by Cattle Business Weekly as one of the Top 10 Industry Leaders Under 40.